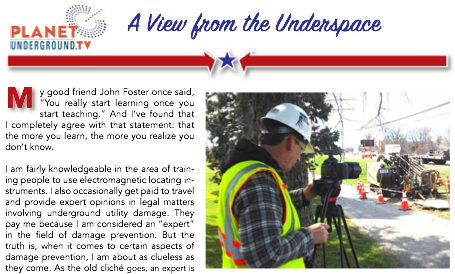 Excerpt from “View from the Underspace”, in The American Locator by Underground Focus. My good friend John Foster once said, “You really start learning once you start teaching.” And I’ve found that I completely agree with that statement: that the more you learn, the more you realize you don’t know. I am fairly knowledgeable in the area of training people to use electromagnetic locating instruments. I also occasionally get paid to travel and provide expert opinions in legal matters involving underground utility damage. They pay me because I am considered an “expert” in the field of damage prevention. But the truth is, when it comes to certain aspects of damage prevention, I am about as clueless as they come. As the old cliché goes, an expert is someone who is “from out of town”, and I certainly meet that requirement. How does one get the “expert” label? I suppose it’s a matter of being both properly trained and properly educated. For example, to become a one-call locator you are trained to use a locating instrument. But to be a really good one call locator, you must also become educated in the field of excavation. The road traveled to become an expert is paved with education. It is essentially impossible to be trained in all aspects of damage prevention. It begins with effective underground utility design and ends with the gathering and collection of precise underground utility location information. And then with this exact location information, design becomes even more effective the next time. Damage prevention is not a straight line, it is a circle. The more you know about what happens along the circle, the more educated you can become.